Brush fish with olive oil and sprinkle with salt and fresh cracked pepper. Grilling is the preferred cooking method, but it can be baked as well. 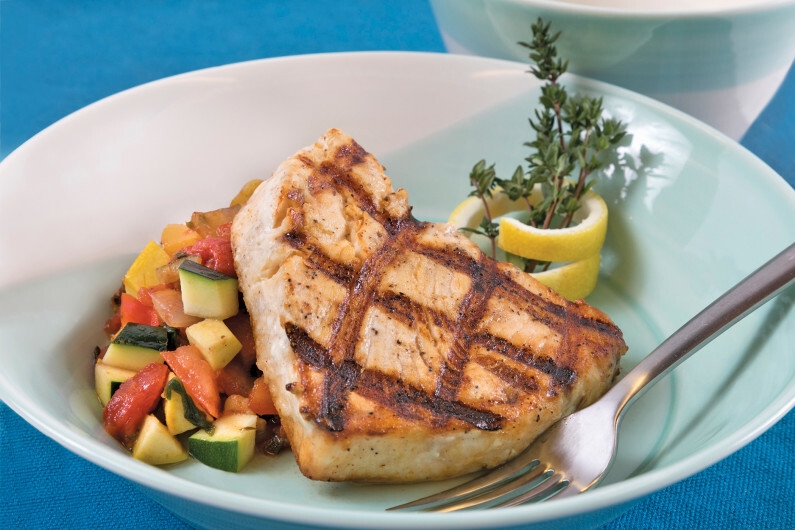 Grill for about 3 minutes on each side, taking into consideration the thickness of the fish steak. The thicker it is, the longer it will take on each side. To bake, cook at 375°F for about 15 minutes. When cooked completely fish will be firm but still moist. Heat oil in a large sauté pan over medium heat. Add onions and cook for 4 minutes or until tender. Add red and yellow bell peppers and cook for about 2 minutes, then add garlic and stir. Next, add squash, zucchini and fresh tomatoes. Cook vegetables for about 5 minutes, then add the cooked tomatoes, stirring until well combined. Add basil. Taste vegetables and season as desired with kosher salt and fresh pepper. Cook for 5-10 minutes, checking tenderness of the squash. When done to your liking, remove from the heat and serve warm.